When we realize that we have trashed our health (or our relationships, spiritual life, home, etc. ), it is always tempting to resolve to change completely today (or better yet, tomorrow). We set out striving to remake ourselves all at once and usually crash and burn within days, if not hours, because our mind and body are just overwhelmed. It took a long time to develop and perfect the bad health habits we have. In my case, it took decades. What I finally learned is that one or two simple changes every week or two are easier to maintain than a dozen or more packed into a day, and those gradual, simple changes added up to real health benefits over a year. The way I eat and move now is so far different from 18 months ago, but it was a little bit at a time. I would say that in 18 months the clock has turned back 10 years in regard to my health. If it takes another 18 months to back up another decade, I will feel triumphant and grateful. 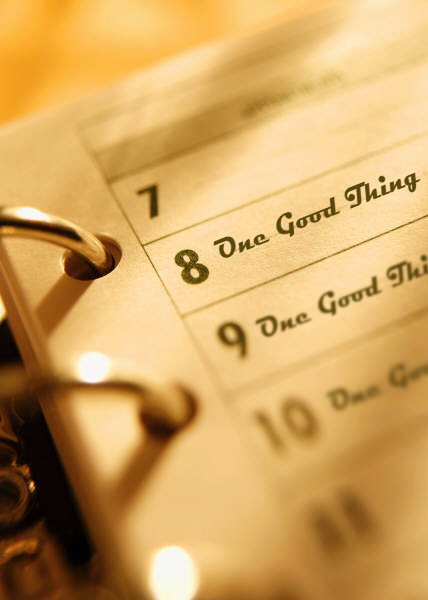 Do one good thing for your health today and then repeat it tomorrow and the next day and the next day. When you can handle a second good thing, add it into the mix. Perhaps join us pursuing 52 Weeks of Health and see how far you can turn back the clock in one year. I am trying to order the suggested changes in such a way that a new change does not multiply the effort of the previous one. For instance in the first week we increased green vegetables while the second week deals with water and sleep instead of altering your meals even more. This allows you to focus on the changes without getting overwhelmed. Take as long as you need to get comfortable with each change. If all you do for the next 6 weeks is eat more vegetables every day than you have been eating, you are better off than you were before. Add a comment below and tell us what one good thing you are introducing to your life today. These past couple of weeks we’ve been eating a lot more dark leafy greens, and my kids LOVE them! It’s usually in the form of salad, which they can’t seem to get enough of!! Love your blog – thanks for your honesty. So happy when I hear of kids loving the leafy greens. They will grow up so much healthier because of it. Thanks for your comments, Lisa. I’ve have been eating a lot of dark leafy greens for a long time (good for eye health too) but have a hard time drinking water in the winter – so your blog has helped me to be much more conscious of the water bottle sitting on my desk and I’ve been trying hard to drink up. Enjoying your blog and looking forward to the next 50 weeks with you!